The TRH Gift Shop is solely staffed by Auxiliary Volunteers and is open at various times throughout the week. The Gift Shop is the primary source of funds for the Auxiliary and also provides a means of "giving back" to the hospital by way of a yearly donation for equipment needed throughout the facility. Members who work the Information Desk and Greeter positions serve as the first contact for many individuals who enter the hospital. Work consists of supplying room information as well as escorting and helping those who may be lost. Auxiliary members are now able to work in certain clinical and other areas such as Radiology, Surgical Services, Cancer Center, Mammography, Cafeteria and Emergency Services. Each position involves, but is not limited to, interaction with patients and families, clerical duties, and general errands. The clinical areas provide the most "hands on" experience with patients and family members. Our Auxiliary members are a critical link in making our patients feel welcome and more relaxed in stressful situations. Work in these areas vary from keeping families informed and making patients more comfortable in surgery or the ER, to filing or answering the telephone. 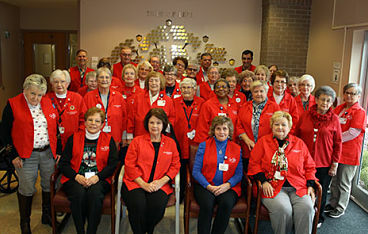 The Auxiliary Volunteers are active in the local community and are involved in many organizations. Each year at Christmas, the Auxiliary collects non-perishable canned goods and donates to the local food pantry. If you would like additional information regarding the Auxiliary Volunteers or to schedule your brief orientation to get started volunteering, please call the Hospitality Services Office at 270-789-5814.